Idaho-based extreme death/grind act INFERNAL COIL has completed a new EP, Bodies Set In Ashen Death, which the band will release in December in conjunction with a US tour. While INFERNAL COIL‘s sonic and lyrical expression is most easily classified as metal, it’s not confined to any limitations. Their 2016 demo, Burning Prayer Of Infinite Hatred, gave listeners a glimpse into the fury and dissonance it delves into. The new two-song EP, Bodies Set In Ashen Death — recently recorded with Billy Anderson at Type Foundry in Portland, and also at Tonic Room in Boise — continues on that path, but also explores more complex, enchanting boundaries. Bodies Set In Ashen Death will be released digitally on December 21st, however an extremely limited version of the EP – a run of 50 lathe-cut records – will be sold on INFERNAL COIL‘s Shadows Against Southern Dusk winter tour, beginning just days later. Several copies of the EP are available for preorder HERE. 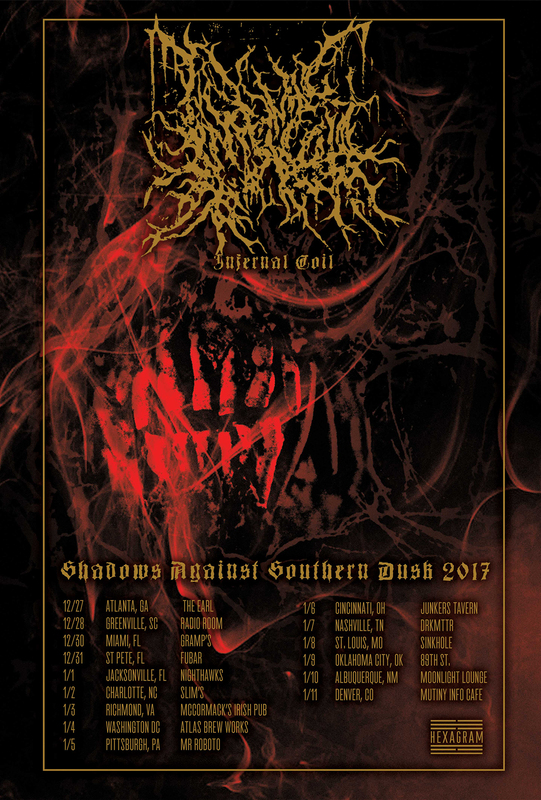 Shadows Against Southern Dusk runs from December 27th through January 11th, with shows in Atlanta, Greenville, Miami, St. Petersburg, Jacksonville, Charlotte, Richmond, Washington DC, Pittsburgh, Cincinnati, Nashville, St. Louis, Oklahoma City, Albuquerque, and Denver. The musical dichotomy of Bodies Set In Ashen Death speaks to INFERNAL COIL‘s conceptual themes of the natural world’s paradoxes, contrasting the beauty and chaos of nature, as well as humankind’s seemingly inevitable self-destruction. The band’s presentation transcends fantasy, instead reflecting a fascination with mammoth concepts based in reality — a genuine expression of horror and awe. Listeners will recognize similarities to founding guitarist/vocalist Blake Connally’s prior band, Dead In The Dirt, but don’t mistake it for a continuation. 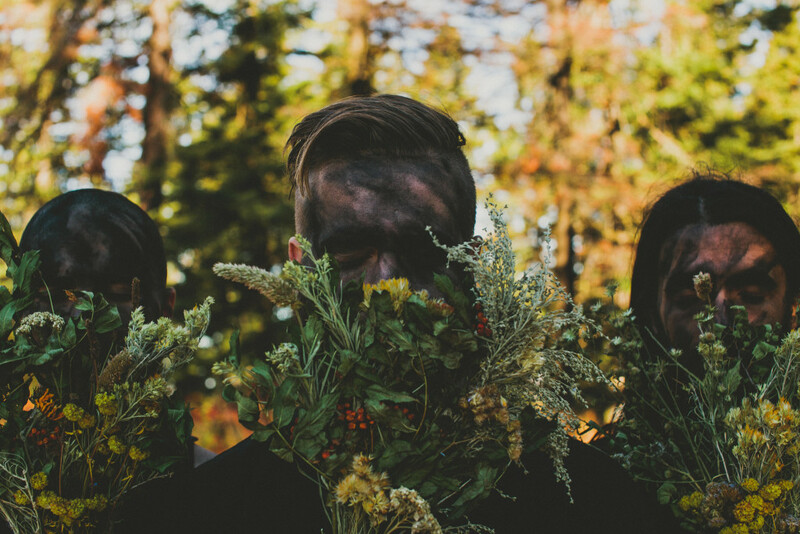 Utilizing pseudonyms within their art, Connally (Folús) is here joined by drummer Brennan Butler (Blight), and guitarist/vocalist Ben Mast (Glum), INFERNAL COIL stands on its own two feet in its artistic expression, breaking barriers we only set for ourselves. INFERNAL COIL will record their debut LP to release in 2018. Stand by for more transmissions from this entity in the weeks ahead.